Ice dancing came to a dramatic conclusion and the men's hockey team advanced to the final on Day 11 of the Winter Olympics in PyeongChang. 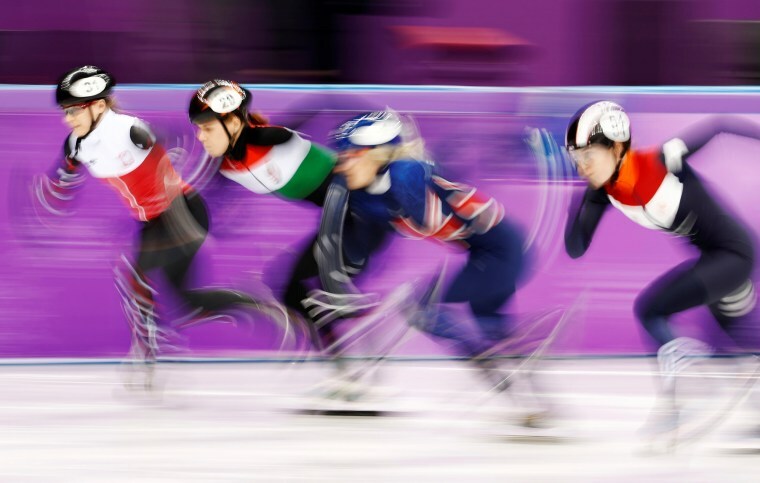 Elise Christie of Britain, Lara van Ruijven of the Netherlands, Magdalena Warakomska of Poland and Andrea Keszler of Hungary compete in the women's 1000m short track speed skating event. Kevin Rolland of France during the freestyle skiing men's ski halfpipe qualifications. 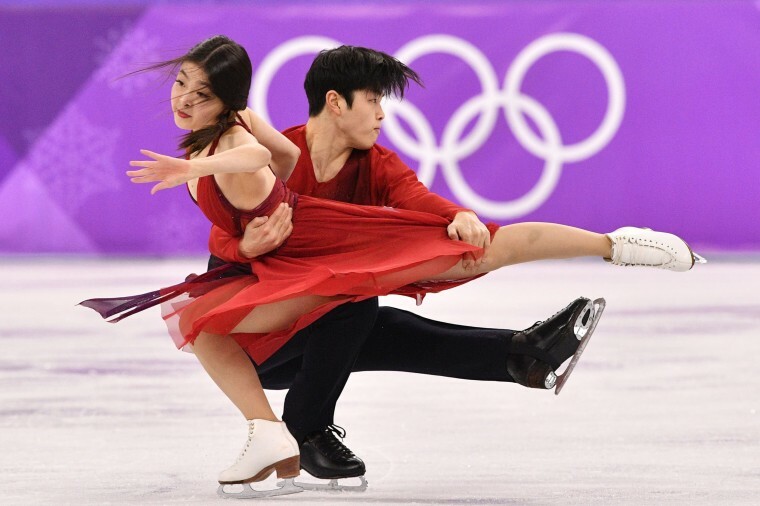 Alex and Maia Shibutani of the United States compete in the ice dance free dance of the figure skating event. Agnes Knochenhauer and Sofia Mabergs of Sweden stretch before a curling practice session. Garrett Roe of the U.S. celebrates with teammates after scoring a goal during the men's ice hockey playoff match against Slovakia. Silver medal winner Marie Martinod of France with daughter Melirose, gold medal winner Cassie Sharpe of Canada and bronze medal winner Brita Sigourney of the U.S. celebrate on the podium after the women's freestyle skiing halfpipe competition. Marie Martinod 's partner, Max, salutes her performance. Goalie Florence Schelling of Switzerland celebrates after the women's ice hockey qualification game against Japan. North Korean cheerleaders sing before the start of the short track speed skating event. 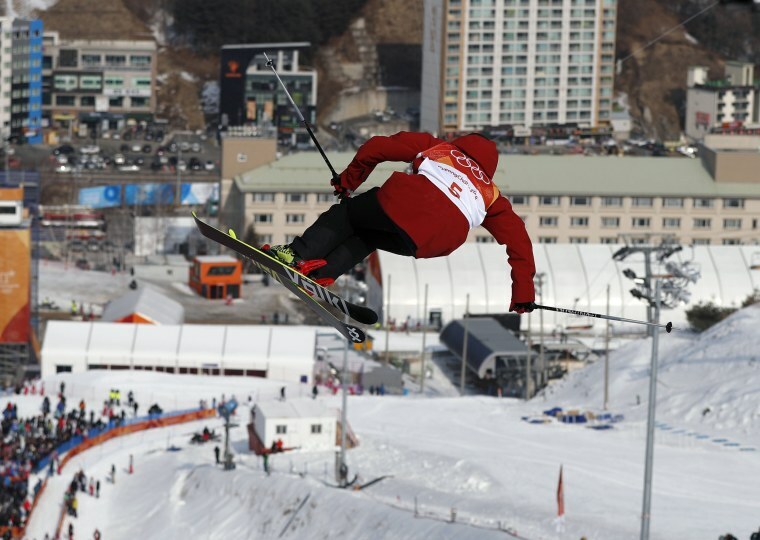 Lee Kang-bok of South Korea crashes during the men's freestyle ski halfpipe training session. 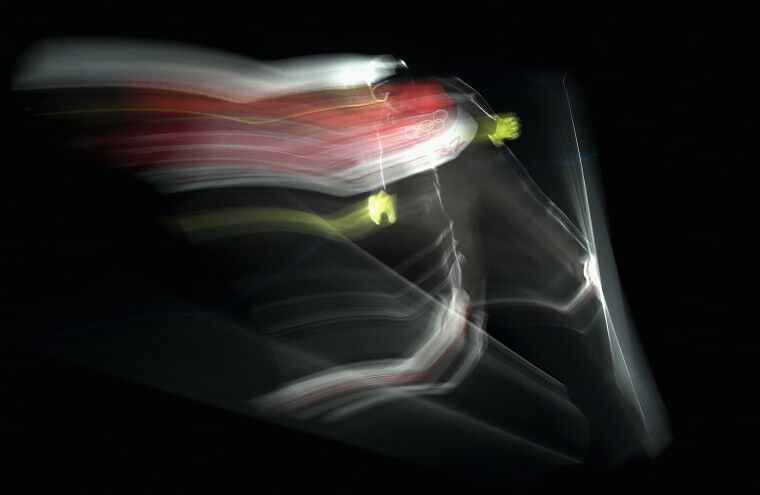 Joergen Graabak of Norway jumps during the Nordic combined individual gundersen large hill trial round. Francois Braud of France jumps during the nordic combined individual gundersen large hill ski jumping competition round. Canada's Tessa Virtue and Scott Moir complete their gold medal winning performance in the ice dance, free dance figure skating competition on Feb. 20, 2018. Canada's Tessa Virtue and Scott Moir complete their gold medal winning performance in the ice dance, free dance figure skating competition. Mikaela Shiffrin of the U.S. skis during the third training session of the women's alpine ski downhill event. A fan wearing Olympic themed glasses watches the men's curling round robin session between South Korea and Switzerland. Maddie Bowman of the U.S. jumps during the women's freestyle ski halfpipe final. Team Norway's Sverre Lunde Pedersen jokes with the photographer as his teammates pass by during a training session for the men's speedskating race. Marie Martinod of France competes during the women's freestyle ski halfpipe final.